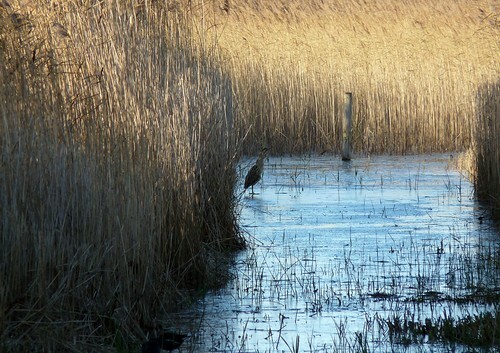 Sunday was biting cold which for me always suggests a trip to Kenfig NNR and its often frozen lake. Despite the cold snap the lake is still roughly half open water which must be a welcome relief to the waterfowl that currently calls it home. Coots, as usual, were by far the most numerous species, but Tufted Ducks and Pochards were also well represented. A pair of Wigeon were more unusual, while a Little Grebe and single Common Gull were nice additions. My main interest though was in the reed beds that border the north and south of the lake. Over the last few years of my visiting I have regularly heard of Bittern sightings but have never been fortunate to see any for myself. Boy was that about to change. We entered the south hide around 2pm, just after an exciting event had clearly occured. The usual raised emotions and digital camera screens being shown around brought on the feeling that I'm sure all birders have felt at some point in their life; if only I had got here a few minutes earlier! We sat down and were told that a Bittern had just been seen walking betwen two sections of reed right in front of the hide. A truly envious view I'm sure you'll agree. I was still hopeful and got myself ready for a long wait. I wasn't going to move when I knew a Bittern was hiding in the reeds in front of me, something my parents learned when I was much younger at the RSPB Minsmere reserve. After less than five minutes one of the people in the hide spotted something right at the back of the furthest left channel. Standing proudly on the ice was a Bittern! Even more exciting was that this clearly wasn't the bird that we were waiting to emerge in front of us. The shot above is one of the more typical views of Bitterns that people get and for me only my third ever. This individual was only on view for a few seconds before it took flight and headed further away into the reeds. Again a couple of minutes passed before what we had been waiting for happened. 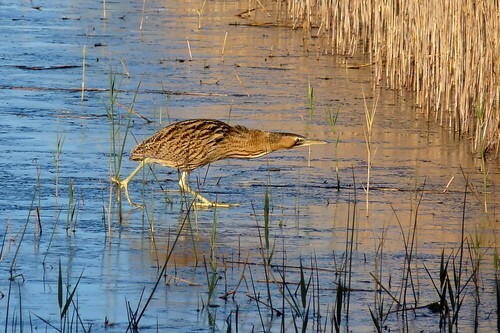 The second Bittern of the day edged out onto the ice before slipping and sliding itself across and into the next section of cover. The lighting was absolutely perfect with sun shining on the bird and the perfect blue sky reflecting in the ice. I couldn't and still can't believe how lucky we were. This particular bird had one more treat to bestow upon us as it once again stepped into the open to our far right. Now in the shade the resulting photograph I feel portrays what a hard life it must be at the moment for our wildlife. After chatting in the hide about how fortunate we had been, Emma and I moved on to the north hide. 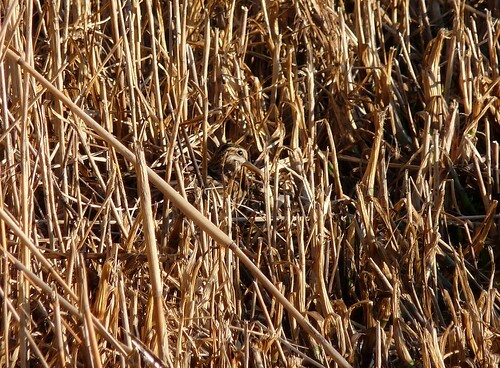 The first bird we spotted was a Common Snipe hunkered down in the dead reeds using its camoflauge to the full. Without binoculars it was seriously difficult to spot. We had been hearing the call of Water Rails on and off all day so it wasn't a surprise to see one on the opposite side of the lagoon. In a first for me I actually saw the bird call. More amazing was the third Bittern of the day that popped its head out of the reeds just above where the Snipe had been sitting. Three Bitterns on one lake in about half an hour must be some sort of record, especially considering the quality of the views. What happened next very nearly topped everything, even though I didn't exactly realise it at the time. From the corner of my eye I saw a large black bird flying along the far shore of the lake towards the south hide. Through my bins I clearly saw a long, grey, down turned beak. Initial thoughts were of Curlew but it was black. It must be a Glossy Ibis then. I couldn't quite believe myself however and as I started to question what I knew I had seen I began to lose confidence and didn't report it for fear of setting people off on a wild goose chase. As it turns out I should have done as yesterday the Glossy Ibis turned up down the coast at Dunraven. A couple of other people have also since reported the bird at Kenfig on Sunday who were similarly cautious. I am so glad that it has turned up again as the sighting had been nagging at me all night. Hopefully it wll stick around for a while and I can try for some photogrpahs next weekend. I have also submitted this post for a new meme World Bird Wednesday hosted by Springman over at Pine River Review so please check it out and join in the fun. Remarkable, Adam - and utterly stunning photos. This blog is a treasure. My dinner sat and grew cold so engrossed was I in reading your great story. Dinner can wait. I felt like a little kid hearing a great bed time story. "Where did the Bitterns come from Father?" I have a thousand such questions. 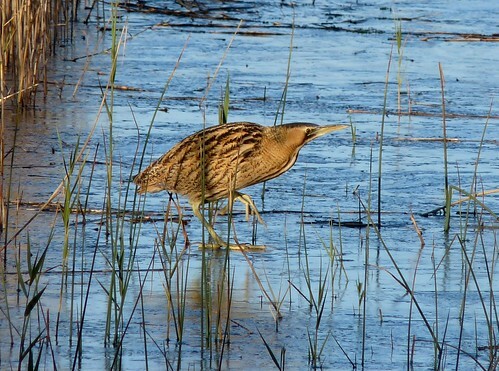 The pathos of the shadowy Bittern that you invoke for the natural elements that our wildlife faces is classic. I've been on your site for an hour. I found that by clicking on your images it took me to your flicker stream where there's another whole slide show of insanely beautiful photography. I can only wonder what else is here. Thanks everyone for your kind words. It is great to hear that others are getting the same enjoyment out of my blog that I get from doing it. Springman in particular I think that is the most beautiful comment I have ever had. Thank you all and I look forward to sharing more with you. Wow! 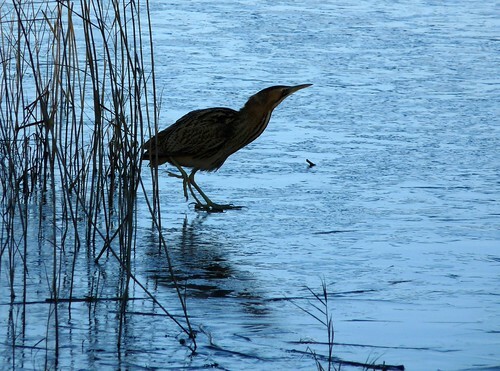 What very cool captures of the Bittern stepping across the frozen lake. Wow!!! I just love bitterns although I have ever only seen a stuffed one we were drawing in art school. Thanks for the animated version. Wow Adam,what an amazing day! Those shots you got of the American Bittern are truly beautiful. Out in full view, with the sun behind you...did you buy a lottery ticket that day? Seriously, these are fantastic photos and the story is enthralling! Thanks all for the comments. Bitterns really are a very special bird when you see them. Larry it's a European Bittern not an American Bittern as I am in the UK. I really did feel like I had won the lottery though. You don't get views like that very often.